The Bigness of Small Poems – #20 in a Series – Hyaena Season Launches! to the sound Man-dart-eh makes in the mouth. the prisoners escaped, gone free. 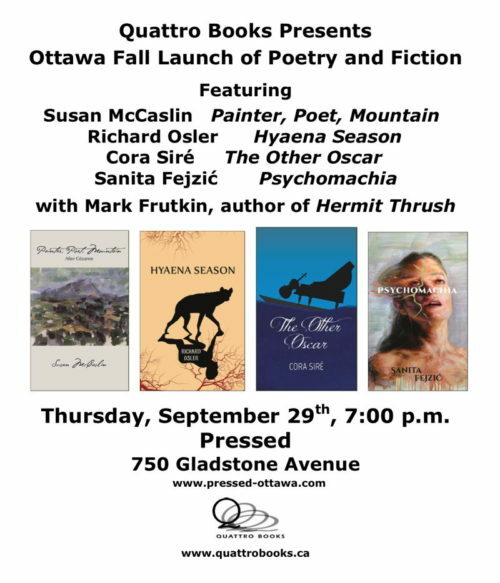 Tonight I am so pleased to joining other Quattro Books authors at the first launch of Quattro Books Fall season. Big thanks to my editor and publisher and Allan Briesmaster who has been such an acute editor and all around support. To commemorate this evening I wanted to include my poem Cherish This World in my on-going tribute to small poems. This poem, I wrote running along the seawall in Sultanahmet, Istanbul. I had to memorize it because I had no pen or paper. When I got back to my apartment and scribbled it down I had to dodge my drops of sweat! This poem mean a lot on many levels. A description, yes, of time my daughter spent living on Mandarte Island with one of the largest colonies of breeding seagulls on the Canadian west coast. But more. The risks associated with things coming to birth. The chance that something incubated may not make it. Even a relationship between a father and daughter. But tonight this poem for me is a metaphor of the long journey of my first book coming to print. All that tapping and a book busted free. With huge thanks to all who supported me on this journey. Now, time for supper and heading off to the reading at Pressed! This entry was written by Richard Osler, posted on September 29, 2016 at 2:19 pm, filed under General, Poetry and tagged Richard Osler. Bookmark the permalink. Follow any comments here with the RSS feed for this post. All the very best to you, dear Richard, on this occasion of new birth! So wonderful to witness this gestation with you. Have a wonderful launch, the first if many for you I hope. Wishing you many successful launches of a well earned book!